February brings more than just Valentines. It’s also the month when schools receive their draft cohort default rate (CDR). Although it’s not the official rate, it’s an important metric to review and can be the springboard for implementing new default prevention plans. While many schools focus time and resources on supporting delinquent borrowers to better outcomes, few understand the opportunity of default rehabilitation. In this post we introduce you to Brendan Shaughnessy, our Cohort Catalyst Call Center Manager. Brendan is a true guru in the world of delinquency and default, with 12 years of experience and amazing results we thought you and your students might benefit from his stellar insight on default and rehabilitation. Q: What is federal student loan default? A. Federal student loan default occurs when a borrower reaches a point where their loan is greater than 359 days past due in payment. At this point a collection agency is assigned to try and collect on the loans. Q. What happens to borrowers who default? Q. Can anything be done to resolve a default? Q. What is Federal Loan Rehabilitation? A. Loan rehabilitation is a federally authorized program that was created to give student loan borrowers a second chance at repayment success. Once they go through the rehabilitation process and demonstrate their ability to make monthly payments, the borrower is no longer in default. It’s a good thing! Their loans are returned to good standing and many of the unfortunate consequences related to default are reversed. Q. What are the nuts and bolts on how loan rehab works? A. If you look at it like a process there’s a natural flow to things. I'll share our approach. First we need to locate the borrower. Frequently, this group of borrowers is unreachable. It may be due to personal circumstances, moving, email changes, or simply not wanting to be found because default can feel overwhelming. Performing skip trace research is critical, because if we can’t find them, we can’t help them! Once we locate them, we counsel them on the program and set up the rehabilitation agreement that’s typically between the borrower and the lender. To get borrowers on the right track, the payments must be reasonable and affordable. 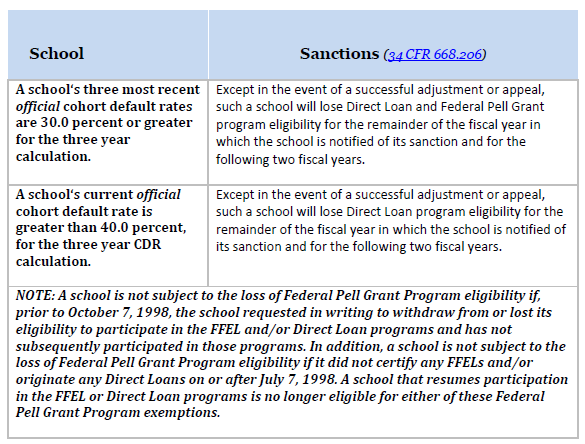 The U.S. Department of Education guidelines are similar to what’s used to calculate payments for the income-based repayment program. It’s equal to 15% of the borrower’s annual discretionary income, divided by 12. Discretionary income is the amount of the borrower’s adjusted gross income that exceeds 150 percent of the poverty guideline amount for their state and family size. Borrowers must provide income documentation to their loan holder. If the borrower can’t afford the monthly payment, they can ask their loan holder to calculate an alternative amount based on the amount of their monthly income that remains after reasonable amounts for monthly expenses have been subtracted. It might seem a bit confusing, but that’s why having an expert service provider on your side is important! Borrowers need to make at least 9 full payments over a 10-month period. Payments must be voluntary (not through garnished wages), paid in the full amount required, and received within 20 days of the due date. Ideally, the default prevention provider should continue outreach and counseling to help borrowers fulfill their rehab agreement. Once fulfilled, their loans return to servicing and they can choose a repayment plan that fits their situation. Q. What are some of the benefits the student receives after going through default rehab? A. It’s truly a second chance at success! We’ve heard from students we’ve helped that they feel like a huge weight has been lifted from their shoulders. Many of the default’s negative consequences are reversed. Like the default status is removed from their credit report, wages are no longer garnished, and the tax offset will end. Their Title IV eligibility is restored too. That means that when they’re ready to go back to school to fulfill their high education dream, they can apply for Title IV funds to help them cover the cost. Q. Aside from a school being able to feel good about their student’s success, does default rehab provide other benefits for schools? A. Absolutely. A school’s CDR can be reduced. 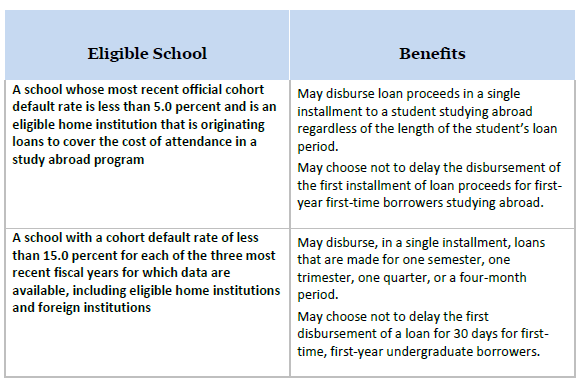 If the rehabilitation takes place within the 3-year cohort period that the borrower entered repayment, the original default won’t be part of the numerator in their CDR calculation. In other words if the borrower can rehabilitate before the close of the cohort period the original default won’t be counted. Q. OK. So now we know the value of default rehab. If schools want to pursue finding a service provider to help them what are some of the things they should consider? Experience and Outcomes: Get the details regarding the number of borrowers and total loan dollars rehabilitated. Ask how long they’ve been doing rehab work? Who are their current clients? Strategy: To all good outcomes there is a strategy, find out how the provider engages borrowers who didn’t seek help prior to default. How do they target certain borrowers to leverage the largest impact? Ask about longevity of employment. Don’t overlook the importance of counselors who have years of experience. It’s a difficult job to do and the burnout rate can be high. Longevity speaks volumes about the company, their culture and the people who perform the work, Shoot for an average 2+ years on the job. More is better as it all goes to experience and being in a better position to support the needs of individual borrowers.